My name is Leslie, and I'm a Jiu Jitsu Addict! World of Jiu Jitsu and to serve as a way to look back on my journey to achieve my Black Belt in Jiu Jitsu. In the past 6 years I have gone through many ups and downs in Jiu Jitsu and my life. This blog has been an amazing outlet and provided me with a wonderful support group! And....for the record, I am not claiming to be an awesome journalist, I'm sure there are SEVERAL spelling and grammar errors but, you get the point! My husband Andrew and I own a small jiu jitsu school in AZ, De Boa Jiu Jitsu Academy, I have a huge passion for teaching and love watching our "family" grow! I train very hard and have "personal" goals as-well but, being able to live a jiu jitsu lifestyle, support amazing, strong females and share my stories is indescribable! My Hubby is a Black Belt and one of my favorite training partners (the only way I could imagine dating and training Jiu Jitsu-it becomes life consuming) It's nice to be on the same page and understand the frequent and long hours of training. My kids are also involved, my son Tyson is a Brown Belt and my daughter Toriana, son Seth and Grandson Cyrus all train as-well. It really helps us to keep the balance of spending family time and training. I teach an all woman's BJJ class, which has a great following, averages 15 girls a class. 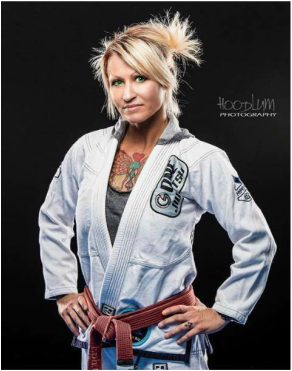 I started JAG to let girls see you can train Jiu Jitsu and still be a girl! This sport is not just for the "Super Athlete", the "Tom boy" or "Youngters" ;) Jiu Jitsu can benefit and change your life, no matter your skills, size, or athleticism. I pride myself in training and fighting hard but still being feminine and showing everyone its NEVER too late to start! *Thank you to ALL who have helped me get to where I am on my journey!